Are we week 3 already? My brooch got a good outing last night (Friday 26th) at the Object Space opening of Best In Show (great exhibition, so many bright young things out there and lovely to see Cheryl Lucas – whom I know as Muff – and her great collection of vessels ‘Dip’). I think I spotted about 5 brooches of the month and their wearers – it was nice to share a new connection with people I see about but don’t really know! We all seem to have gone quiet! I was hoping the arrival of spring would bring BOM people out into the open. It is spring isn’t it – daylight savings has started – good grief – already – the blossoms are out, the lambs are in the fields (ignoring all those poor creatures who met their demise in a snow storm down south), the pair of kereru that feed in the puriri tree outside my office window are back, so I trust BOM wearers will likewise burst forth displaying their (temporarily owned) creations. Gillian’s brooch has had a number of outings and for a change I have had comments from people wanting to own it. I like the luxury of this being (semi)precious metal but with some less conventional treatment to its manufacture, design and finish. The brooch is deceptively lightweight which makes it easy to wear on a range of garments. It’s one of those versatile pieces that can be part of ‘dressing up’ (in the traditional sense of such) or everyday display and adornment. This is certainly one of the more ‘easy-wear’ BOM offerings to date. I trust Lynsay is enjoying revisiting her homeland and I hope they don’t think she’s given up her Irish accent for a Kiwi one! Well Gillian, your brooch was overlooked during a recent break-in at our place – taken out of its box and tossed aside – not sure how to read that except ‘lucky’ – I don’t think the thieves were particularly discerning in the aesthetic sense as they tended to opt for obvious gold jewellery or sizeable art pieces – my Blair Smith “Domestic icons” necklace from the mid 1990’s has walked, as has my Lynne Kelly charm bracelet – one of the “Pohutukawas flowering before Christmas leads to a long hot summer” bracelets – if anyone should be browsing on TradeMe and spot anything that looks like that, do let me know. So I will be returning Gillian’s brooch at the swap meet this week. It’s been a very easy brooch to wear as previously noted. I’ve had a few comments which usually start ‘oh that’s nice’ on first glance which changes to ‘that’s interesting’ on closer inspection as the less conventional aspects of it become apparent. I love this brooch. I’m a long-time convert to works of silver and am particularly taken with works where the medium has been manipulated in order to render it unusual and different from what one expects. This work has fitted in perfectly with my small jewellery collection. I think this is perhaps why it hasn’t elicited much comment from my friends and acquaintances: I am certain that they think it’s mine and that they have seen it before. This piece fascinates me. Why the hole? What is its significance? When worn on black [on which it looks best] I think of it as an abyss into which one looks and ponders on the story behind the creation of this piece? It seems as if it might be the aftermath of an eruption leaving behind a crater with pieces of debris scattered about. It has been rather fun to have a work that doesn’t have a title so that one’s imagination can run free. Somehow this work manages to create an impression of both strength and delicacy at the same time which is rather clever. It’s been such an easy brooch to wear, fitting in perfectly and looking fabulous on black. I am sorry to be handing it back as it’s been a very congenial and thought-provoking companion. I have been travelling a lot and haven’t had many opportunities to wear this brooch. However on the two occasions I did I was told I needed to wear darker shirts (I am terminally drawn to white) to provide a better setting for it. A curious sign, but a sign never the less time it was catching the eye of others. When you sit down to draw Gillian’s brooch you get to realize just how intricate this piece is. I received ‘Untitled’ a week or two late – and I really missed having a BOM Brooch to wear. Once I had the brooch I gave ti quite a few outings in a row – mainly to work. The guys I was working with at JWAT (Wallace Trust) really liked this brooch. M said it is his favorite so far. That being said, I thought , Yay, These guys are taking notice. These guys are watching my BOM changes. They are really getting interested in contemporary jewellery!! I had the feeling that the brooch pin might be a bit delicate – and I worried I might break it – but it has held up. When Gillian won the Regal Casting Award – I proudly pointed out her brooch over the next few days. This is an impressive piece of contemporary jewellery and I feel privileged to have had the chance to experience wearing it. A quiet but surprising piece of Art. I have worn Gillian’s piece religiously every day that I can. People marvel at its beauty and are troubled by its image – a wound, a bullet hole, a sore. Making people think about the brooch has encouraged other to think about wearing one. Congratulations Gillian on being a winner. It was great to see your brooch featured in Urbis. Too little time, not enough things to wear Gillian’s brooch to! And this one really appeals to me – loved it…. Yet in the box it looked fun but I wasn’t sure how it would ‘suit me’. However, fantastic, looked great on me (well that was my thoughts) and everyone else liked it too. Funnily enough wore it to the MOAD opening and who was serving at the bar, but Gillian, so had a good chat with her. Thanks Gillian, great brooch, loved wearing it. I had a chance to wear this to a few pre-Christmas functions and always got very positive comments each time I wore it. Many people talked about it as if the silver had been pierced by a bullet. I sort of thought of it as evidence of an eruption from within. My heart had exploded … the piercing in the brooch was the tangible evidence of intangible tumult. My last brooch in the B.O.M. project. 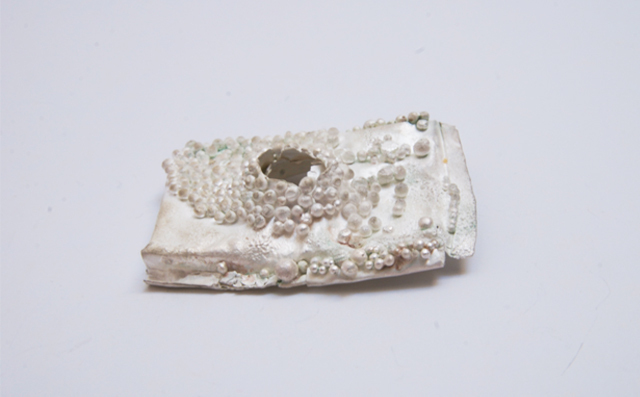 I have had some interesting comments, people are very intrigued by the texture and dull sheen of the brooch. The best comment or the one I liked the most, was from J @ Art Station. She said it reminded her of a ‘chameleons eyes!’ I like this though as the ‘eye’ shape changed colour as I changed garments. The pin is not so good, as the brooch tends to slip around especially on light summer fabrics. All in all it has been a great experience to be a ‘BOMER’. I think – if any future project is envisaged, maybe 6 months would be a good period. I missed wearing my own jewellery. Thank you to all the jewellers, for sharing your brooches with me. Beautiful, intellectual, textile, dimensional, industrial, explosive, now!! Thoughts are racing, and yet this beautiful piece is beyond description. It’s so outside any frame of reference, and so pushing the barriers to the “edge”. I love it. This is everything a worn piece should be – it tests the wearer and the viewer to extend our horizons. This is new thinking, and it inspires. Thank you for your genius, your courage, and your risk taking to forge new terrain in the world of object making. You are a true artist!